For more information, check out singatcornell.com! The Cornell Chorus, a premier touring choir founded in 1920, features singers from a wide variety of majors and backgrounds whose dedication to music has earned the ensemble a reputation as one of the nation’s finest treble choirs. The Chorus performs a diverse repertoire, ranging from masses and motets to spirituals, folk songs, and other classical and contemporary pieces. Since 2001, the Chorus has annually commissioned new works by female composers, with the goal of expanding the contemporary repertoire for treble voices. Regular recordings and tours bring the Chorus’ sound to a wider audience. This year, the Chorus will embark on a tour through Canada, ending the tour in Boston at a treble conference hosted by Harvard University. The Chorus regularly collaborates with their sibling group, the Cornell Glee Club, on major works and other SATB repertoire. Please direct any questions about the Chorus to chorus@cornell.edu. The Glee Club, our university’s other premier touring choir, is Cornell’s oldest student organization (founded in 1868), and is recognized as one of America’s outstanding male choirs. Typically numbering about 55 singers, the ensemble performs and records a wide range of repertoire from the Renaissance to the present day, including annual commissions of new music. The Glee Club gives concerts frequently both on and off campus, often combining with their sister group, the Cornell Chorus, for larger-scale projects, including major works with professional orchestras and international tours. The Glee Club’s coming year is filled with exciting performances, including our annual Homecoming concert in October, a weeklong tour to the Midwest in March, and one of J. S. Bach's greatest masterworks in May. Please direct any questions about the Glee Club to gleeclub@cornell.edu. The Chorale is a mixed choir open by audition each semester to Cornell students. Chorale members have the rare opportunity to focus intensively on the development of their individual skills, especially those essential in ensemble singing: sightreading, vocal technique, interpretation of various musical styles, rehearsal approaches, and so on. The emphasis is on developing the complete singer, and opening doors for a lifetime of performance. Chorale concerts often feature solo or small-group performances in addition to the entire ensemble. 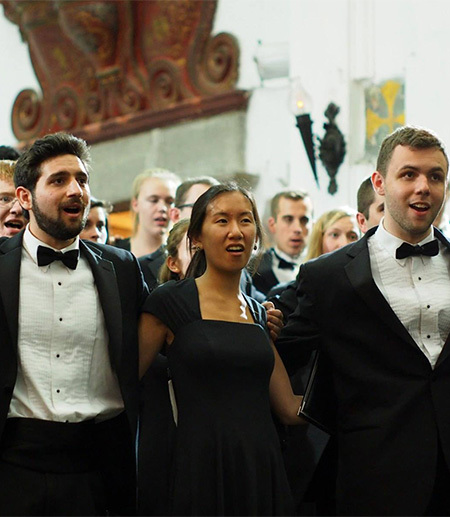 Many students sing with the Chorale throughout their Cornell career; others use the class to finetune their skills in order to audition for further ensembles. The full Chorale rehearses on Fridayafternoons from 4:30-6:45 PM in Lincoln Hall, with section meetings on Mondays or Thursdays from 4:30 to 6. Please direct any questions about the Chorale to chorale@cornell.edu. The Chamber Singers are a smaller ensemble for singers with advanced skills. Prerequisite: at least two semesters of Chorus or Glee Club, or equivalent experience as determined by the instructor. Auditions for the Chamber Choir are by invitation and will take place in the first week of September. For more information about the Chamber Singers, please email ChamberSingers@cornell.edu. More information about choral singing at Cornell can be found at singatcornell.com. Singers may also wish to investigate the Middle Eastern Music Ensemble and the Jazz Ensembles, both of which include small numbers of singers. For more information, see the Instrumental Ensembles page.